This is a guest post written by Jessica Thiefels. Want to contribute? Check out the 2017 publishing calendar. In today’s online world, good SEO is a necessity for businesses of all types and sizes, including your coaching business. Without SEO, your website won’t be found online—which means you don’t exist for many people. If you have the basics in place, then you’re on the right track. Now it’s time to focus on optimizing and testing new tactics to drive more leads. The following three ideas are simple to implement and designed to attract highly targeted traffic that you can turn into clients. Everyone wants to save money and if you’re offering potential clients a discount, you want them to find it easily so they’ll choose you over a competitor. Instead of just promoting these offers on social media and your website, create a specific page for the various discounts and coupons you offer. If people search, “Career coach discounts,” for example, you may be the one to come up in search because your page is indexed and ranking. How do I find work after being laid off? How do I leave a job I hate? Use Google’s Keyword Tool to the find the questions that get the most searches and focus on those ones then start creating content. If you have a blog on your coaching website, write posts with those questions/phrase as the title and focus of the content. If not, you can create a variety of SEO-specific pages with a call to action (CTA) at the bottom, specific to that question. Title: How do I find work after being laid off? This SEO tactic serves two purposes — The first is that you’re driving targeted traffic to your site with a page that accrues SEO juice over time. 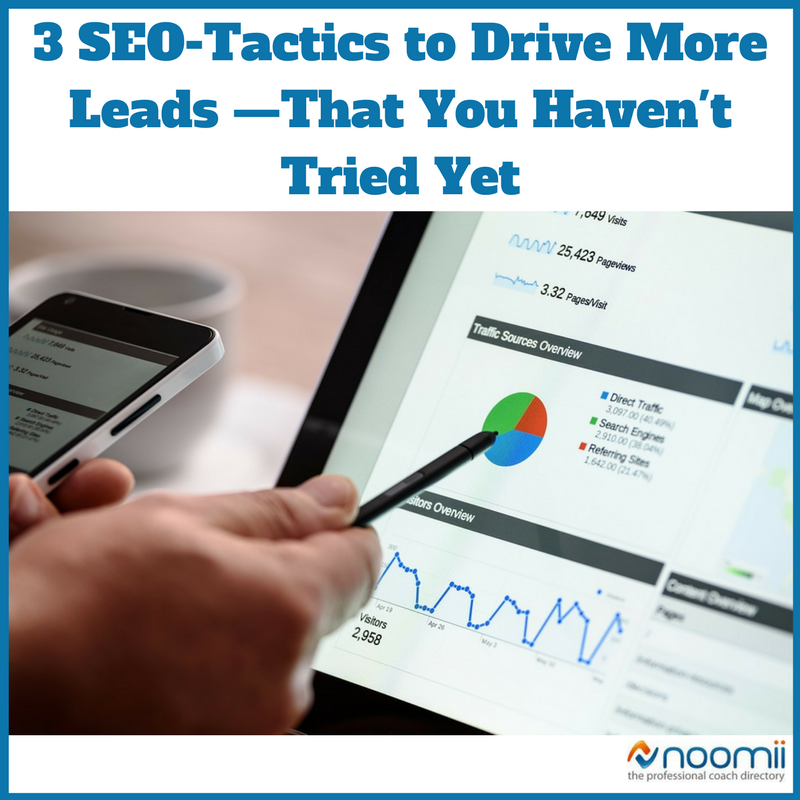 The second is that you’re funneling that targeted traffic to a CTA that appeals to them, turning visitors into leads and eventually, into new clients. As a coach, you have a plethora of knowledge to share with people, including current clients and those outside of your client base. Guest posting is a great way to share that information and build a brand for yourself, while driving SEO and traffic to your site. Search for high-ranking, high-quality websites (40 Domain Authority or higher) that talk about careers, career coaching, work-life balance — wherever you think your opinion and experience could add value. Reach out to the editor to offer your article, with the subject line: “Expert Article Submission.” In the email, briefly explain your experience and the topic you plan to explore. Use a tool like Clearbit, which acts as an add-on to your email account, to find contact information for each website. When approved, you’ll be able to write your article and include a bio where you’ll put a link back to your website, social pages and any other important online assets (eg. ebook or specific landing page). This link will collect link juice and value, boosting your SEO in Google’s eyes. Make a goal to facilitate one guest post opportunity a month. This gets you in the practice of reaching out and writing and hopefully earning at least one link per month. If you have the budget, consider hiring a freelance writer who can do the writing for you. After editing to make sure it fits within your brand and voice, you can send it off the editor for publishing—allowing you to focus on other important tasks while maintaining your guest-posting schedule. These three SEO tactics are doable for every coach, regardless of budget or available time. Add them to your to-do list and test over the next few months. If you find that traffic or your client base isn’t increasing, consider testing other ideas or tweaking meta data and SEO terms — keep track of your experiments so can decide what works and what doesn’t to be more successful.